With all the huge sporting events going on this year; there’s never been a better excuse to get outside in the sunshine (like we need one)! Whether you’re off on a bike ride, picnicking in the park or barbecuing in the back garden, you’ll want to spend as little time in the kitchen as possible. This simple recipe is a quick and easy twist on a traditional potato salad – it’ll look great on the plate and is easily transported in a box if it’s food-to-go. A great accompaniment to burgers and something a bit different to sandwiches, why not give it a try? 1. First, simmer your potatoes for 15-20 minutes – when cooked, your potatoes should slide easily off a sharp knife. If you haven’t done so already, use this time to slice your cherry tomatoes (keeping an eye on the hob of course!). Once done, drain your potatoes and leave to cool. 2. Mix your pesto, olive oil and lemon juice together to create a dressing. 3. When your potatoes are completely cool, add these to a large bowl and combine with your cherry tomatoes and peas. We’ve kept it simple but at this stage you could add absolutely any veg you like! 4. Next, pour your pesto dressing over your salad and toss or mix around with a spoon to make sure everything’s covered. 5. 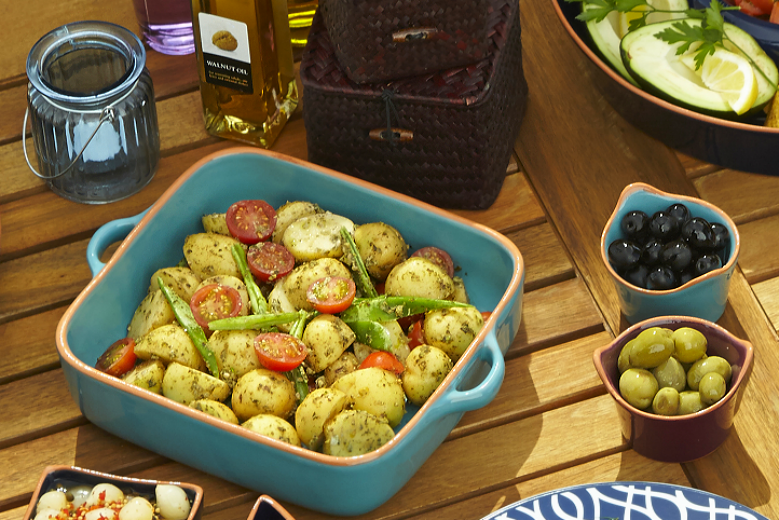 Finally, arrange your salad in a nice dish to be enjoyed by family and friends – we chose this teal one from our Neptune range but there are loads of others to choose from in-store and online. Ooh and just before serving don’t forget to squeeze the other half of your lemon over the top and season with salt and pepper. Perfect!